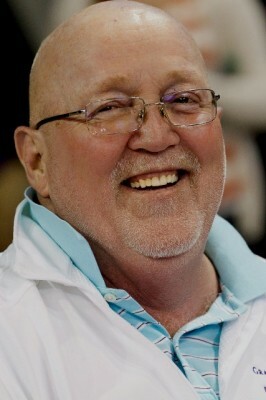 The abundance of smiles left behind in his large wake. Beggs is part professor, part rapper, part world traveler, part artist and even part failed basketball coach. But to most, the biggest part is the one they call a friend. “I love him because he’s crazy,” says Faith Weese, chief university relations officer at GCU. “And he’s just really personable. He does the most fun raps; he never forgets the humor in almost everything. He really, really cares about people and he’s just a big teddy bear. In many ways, Dr. James Beggs has been the face of GCU during his 11-year tenure. At age 67, Beggs is stopping. After a 37-year teaching career, including the last 11 at GCU, Beggs is retiring at the end of the school year. A retirement party will take place from 1 to 2:30 p.m. today at McKinley Hall in the Student Union. As part of the farewell, several GCU employees paid tribute to Beggs in the same way he did for so many others – with a rap video. Any conversation about Beggs’ persona begins with his rap videos, which have become an institution at GCU. They started as a way to connect with students and engage them in a different way while helping them remember key elements of a lesson plan. His first rap involved the teachings of classical theologian and philosopher St. Thomas Aquinas. English professor Jim Helfers caught wind of the rap and started calling him “Rap Master B.” “He’s never been afraid to put himself out there in a dramatic sort of way,” Helfers says. Beggs’ raps, of course, aren’t always educational. Sometimes they’re just fun – like a rap he does at the end of a school year that includes every student’s name in a class, or one he did after a staff wheelchair basketball team that he coached was annihilated by the Phoenix Suns’ wheelchair team during halftime of a GCU game. “The raps have turned into something that, no matter what the event is, whether it’s a birthday for somebody, somebody leaving the campus, somebody having a baby, a special event on campus … any time he has an opportunity to put one of his rap videos up, he does,” says Mike Lacrosse, GCU’s chief technology officer. And, while he gets positive feedback from students, he also sees the eye-rolling as they watch the videos. Connecting with people never has been a problem for Beggs. He’s at nearly every event on campus, from move-in day to athletic events and theatre productions or concerts. 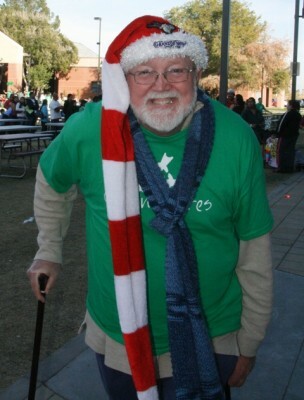 Looking more like Santa than St. Nick himself, Beggs brought the holiday cheer to Canyon Cares Christmas. Danaher’s first encounter with Beggs still sticks in his mind. Danaher had applied for a job at GCU and knew of Beggs through a professor at Arizona State University. Beggs, a lover of food, is also well-known for the treats he brings to different offices – particularly around the holidays – and the Christmas parties at his house. Some of Beggs’ gifts have included embroidered pillows and shirts he makes by transferring images from a computer, and glasswork he creates from a kiln he bought when the ceramics department at GCU closed. Being the social conscience of the University is not all Beggs has brought to GCU. When the Richardson family bought the university at a time when it was failing, Beggs was instrumental in the transition. He became dean of the College of Liberal Arts and Sciences, which underwent hefty cuts and changes in direction. Beggs served as dean for two years before returning to his role as a professor. Beggs formed a friendship with Richardson during those times. As an employee appreciation effort, Richardson agreed to foot the bill for a group of 10 staff members to go to France one summer. Beggs also has taken trips to Morocco, Austria, China, Germany, Honduras and Venezuela — teaching as a visiting professor on most stops and bringing that knowledge back to his classrooms. 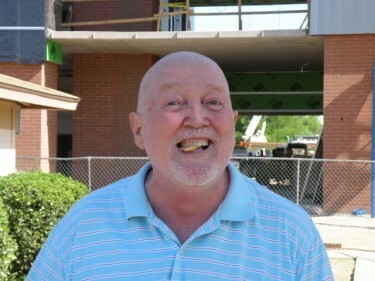 That's an animal cracker in the mouth of Beggs, who never has a problem with making himself the target of the joke. In his first act of retirement, Beggs is taking a trip to Peru this summer to teach English. Beyond that, he says there’s nothing concrete, but he might spend time creating more glasswork and perhaps doing some writing. “I have delusions of adequacy as it pertains to the possibility of writing something,” Beggs says. And as he looks forward, he can’t help but look back at his time at GCU. “I’m sure I’m going to miss many things about being here: the students, the excitement of being in an institution that is growing and vibrant and makes a great deal of difference in the lives of our students, as well as the lives of people in our community and across the Valley, across the country and even the world,” Beggs says. “I’m not silly enough to think I won’t miss a great deal of that. Ah,yes, Dr. Beggs. I first had him as a teacher at Miami Christian College. I love him. It is because of him that I made it through my darkest days after Hurricane Andrew and a divorce. It was because of him that I knew I could make it. 1. What they have done with their life! “OBVIOUSLY, BEGGS you have done a great job of making the most of the opportunity the good lord provided you, which is GREAT! 2. I am curious about what people are going to do after retirement; I have found that some people find a great amount of enjoyment doing things, that noone (sometimes including them) ever dreamed they would do! James; the best to you and many years more to do all the fun things before you. Ohmygosh, what nice things they say about you! If they only knew the man I remember from back at BBC! Ah, yes, Dr. Biggs, your retirement should be filled with the glorious memories of achievements reached by few that are half your age. And, as we all know, you would never act your age anyway. So, it’s out to pasture, now, young man. Take along your tomes of Shelly and Keats; sneak in a bit of Dickinson to keep you balanced. Find a nice place to sit and ponder. Enjoy the rainbows. Smile. Enjoy all of God’s great blessings. We’ll meet again some day, my friend. We’ll meet again.